Turks Cay Resort & Marina offers a six-star luxury experience. We often say the Turks & Caicos Islands are made up of some 40 islands and cays. A new one is being added this year—Turks Cay Resort & Marina. Planned to sprawl over 16 1/2 acres of secluded shorefront and bluff and including a secluded cove, Turks Cay will be the home of an unmatched oasis for aficionados of the country’s rejuvenating blend of sun, sand and sea. This aerial rendering depicts the layout of the resort and marina, centered around a secluded beach cove, with the marina to the back of the drawing. Turks Cay Resort & Marina plans to introduce a luxury experience in beachfront resort living that will usher in a new era in TCI accommodations. In a befitting twist of fate, it is located on the site of Providenciales’ first hotel—the Third Turtle Inn—and flanks the birthplace of tourism at Turtle Cove. The property also embraces the lovely cove at Babalua Beach, long known for its fine, white sand and colorful offshore reef, and tiny Diddly Cay. This quiet residential area is set apart from the Grace Bay bustle, with limited access and limitless privacy. All of these features attracted self-made developer, entrepreneur and philanthropist Arik Kislin, best known for the Chelsea Markets in Manhattan and the Gansevoort Hotels in New York City. Arik was initially involved in the Gansevoort Turks + Caicos, a chic and successful resort at the western end of Grace Bay. After stepping back from that project, he focused his enthusiasm and skills on Turks Cay. 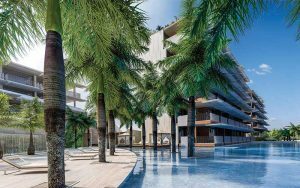 The project’s first phase will include a total of 143 suites, including 11 penthouses in four, six-story buildings fronting 780 feet of private beach cove. Studios are over 700 sq. ft. and include a walk-in closet, kitchenette and an ocean view terrace. At over 1,200 sq. ft., one bedroom suites include a full kitchen, separated living space, work area, and a large terrace with outdoor showers. With nearly 1,400 sq. ft., master suites boast panoramic views and natural wood furnishings. The cunning arrangement of units allows owners to combine more than one into a two bedroom with lock-out for rental. The huge rooftop penthouses boast over 5,000 sq. ft. and unrivalled views of Provo’s spectacular north shore and reef, an ever-changing kalidescope of color. Three large pools, carefully planned to offer sun and shade areas, along with varying depths, wind between the buildings. Part of Arik’s research included a detailed study of sun and wind patterns to best design outdoor areas for comfort. 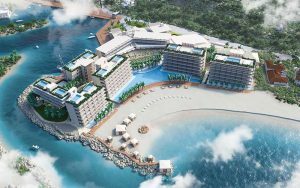 The beach cove will be encircled by private cabanas, while each of the three swimming pools will offer sun and shade areas, deep and shallow water sections, and, of course, pool bars. The public space design and water features placement expands space between buildings, lending the property an uncrowded appeal. 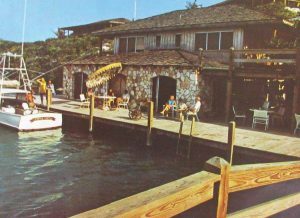 I predict that a favorite place to explore will be the wooden boardwalk above the cove’s rocky border, with private cabanas set along its length. After spending years among the high-end yacht and private jet crowd (many of whom attended his on-site 50th birthday bash earlier this year), Arik promises a six-star experience from start to finish. He says, “We’ll have personal butlers meet and greet owners and guests at the FBO or from a private lounge at the airport. Of course, we will already have learnt their personal preferences—everything from their preferred room temperature to the foods, beverages and music they’d like in their suite. While we expect some of our owners to rent out their units when they are not on island, we have no restriction on the length of time people can stay. This is unique among resort/condominiums.” Arik adds that certain areas of the resort will be designated as adults-only. Some owners may arrive via private yacht and the Turks Cay Marina will welcome boats up to 125 feet. Here they will find a premier marina facility, including locker rooms, lounges, showers and recreation for transient crews. But Arik Kislin’s years of research uncovered a surprising discovery. After spending much of the early part of the day on the beach or in the water, many TCI guests are eager to find something else to do. There will be no lack of that on Turks Cay. In fact, the resort will include over 200,000 sq. ft. of amenities! Dining choices will range from gourmet, world-class eateries to cafés, a pizzeria, sushi grill and an ice cream parlour. The secluded spa/sanctuary emotes vibrations of tranquility and rejuvenation with a wide range of the latest health and beauty therapies. This is complemented by two gym/fitness centres and a unique, high-tech multipurpose facility. As Arik explains, “This 9,000 sq. ft. space features an advanced flooring system using customizable LED marking lines. This allows it to be used as a basketball, tennis or racquetball court or an area for weddings or corporate events in the case of bad weather.” A large banquet facility supports the hosting of such events. There will even be a dog hotel so pets can enjoy the cay as much as their owners. Turks Cay owners and guests will also have for their use a 40 person screening room, similar to an IMAX theatre, and a library designed to encourage “quiet time.” A cigar lounge offers top tier cigar and drink selections, while a sophisticated evening lounge entices with live entertainment. Paradise does occasionally experience rain or a cloudy day. Turks Cay cunningly combines guests’ desires for things to do when the weather is bad with the island’s need for an attractive public shopping area. While Turks Cay residences will be secure, private, and only accessible to owners and guests via a gated road, the eastern side of the complex will include a public boardwalk with high-end designer shopping, as well as a casino. While the project will proceed in phases, government approval has been granted and construction will start this year. Turks Cay Resort & Marina is represented by Hamilton Real Estate, a Savills International associate, founded by native Norman Hamilton in 2006. Sam Hunt, the exclusive agent, says initial interest is high, and unlike other resort/condominiums on the market today, Turks Cay construction is not contingent on pre-sales; all the financing is already in place. The original Third Turtle Inn was built in the late 1960s to accommodate luxury travelers of the day. It stood on the bluff, which will be part of Turks Cay Resort’s future development. It’s interesting that Providenciales’ first visionaries were the wealthy Duponts and Ludingtons, who arrived in Turtle Cove in the 1960s and set off to create an idyllic island hideaway, which was once a haunt of celebrities including supermodel Cheryl Tiegs, baseball great Ted Williams and Jaws author Peter Benchley. Their investment spawned the Providenciales of today. Arik Kislin’s dream of building a “game-changer for the island” 50 years later is much different in appearance but reflects the same dream. For more information, contact Sam Hunt at 649 941 4422 or 331 4066 or visit www.hamilton.tc.